I did NOT watch the ballyhooed Ken Ham/Bill Nye debate yesterday. The reason is I know all the arguments already, on both sides, and find that arguing about things like this to be silly. People on the pro-creation side will claim victory and send out Twitter quotes and people on the pro-science side will do the same, each attempting to make the other one look stupid or silly. I do not think it is reasonable of science to attack spirituality and I do not think it is reasonable for people of faith to attack science. So here are some Greenbean perspectives on the issue. 1. The Bible is not a science book. In fact, to attempt to twist the Bible into a science book is to minimize its meaning and alter its message. For example, the point of Genesis is not to tell us how God did anything. The point of Genesis is to inspire us with awe at the wonder of all that God has done. 2. God has revealed himself in the universe, and he has given human beings the ability to study, learn and discover. Therefore, when we learn, study, and discover anything about the universe we are learning about God, and God is bigger than our theological constructs and our limited worldview. To study the universe (at its largest or smallest expressions) is a noble and worthy goal. 3. Even though there are clearly moments when science can be evil (atomic weapons, poisons, human experimentation (i.e. during the holocaust)) in the end science is good and beneficial to the world and for humans. 4. Even though there are clearly moments when religious faith can be evil (jihad, crusades, power abuses and manipulation) in the end faith is good and beneficial to the world and for humans. 5. When scientific data describes things that the Bible or faith does not (i.e. evolution, age of the world, etc…) the response of people of faith should not be “No, you’re wrong,” but instead it should be, “Wow, that is interesting. I wonder what else we might discover if we keep looking.” Truth is truth, and as people of faith we are called to pursue all truth regardless of its origin, and facts are truth. To ignore facts is to deviate from truth. Embracing truth will inform our faith and help us appropriate a knowledge of Christ that is deeper and richer than what we had before. 6. Science cannot explain everything. As wonderful as it is, there are aspects of humanity and creation that are mystery. Love, behavior, emotion, desire, life and and even self-awareness itself are beyond the ability of science to fully comprehend. Science can describe these and inform our understanding of the processes (such as neuroscience and psychology) but it cannot give us insight into the biggest question of all. Why? 7. People of faith and people of science need each other in order to provide balance to the human experience. In the absence of science superstition and magic replace reason and logic and this is no good for anyone. In the absence of faith people become fatalistic and materialistic, and this is no good for anyone. Both results in violence and ignorance. History teaches us that when superstition reigns people die (witch hunts, human sacrifice, holy wars, etc…) and society is stunted. This is the worldview of Islamic terrorists. Contemporary culture teaches us that when people believe and live as if human beings are only animals with no spiritual connections or consequences that they kill and abuse wantonly, and psychopathic behavior erupts. An example of this is the phenomena of school shootings. 8. Arguing solves nothing. I believe in apologetics–defending the faith and offering answers to questions–but not in an environment that is clearly more for show and sport than for spiritual advancement. Solid apologetics are done everyday by pastors, teachers, academics, and anyone who takes the time to be informed on issues and then who speaks with love and compassion, not with ‘gotchas.’ All debating does is drive the wedge ever so much deeper into an already frighteningly divided society. 9. Literature, art, music and coffee shops are the best places to have these discussions. It is one of the reasons I write about the dark side of science (The Deep Cove stories), about the traumas of faith (The Land Begins to Heal, the Haunting of Pastor Butch Gregory and other Short Stories) and why there is so much pain in the world (yet untitled unpublished novel). So these are some of my perspectives. I’d love to hear some of yours, so long as we keep it all civil. With some minor variations, I really agree with what you say. I am going to watch the debate, if I can make it through, but I do doubt anything good will come of it. keep me posted, please, of your impressions of the event. thanks for reading and posting. Y ou say you did not watch the debate , i have not seen it either ,but ,If you “know” the answers to both mens arguement . why don’t you tell us who is wrong and why ? ray–thanks for reading and commenting. by the use of the word ‘know’ i mean to imply that i am familiar with the arguments on both sides of the issue. i think they are both wrong because they seek to deprive the other from legitimacy. my perspective is that both faith and science are important and both have a role in every day life. again, thanks for reading and commenting. My sense of things is that the two extremes of the argument have been talking past each other for years. Positions have been fortified in concrete and steel. Debates like this one (of which I only caught a small sample on NPR) are two people who are absolutely sure of their positions, and, yes, see no legitimacy in the other. Christians need to let go of the idea that there is an easily readable, straight-forward gospel that can be read in nature. It is not so easy. Moreover, the reading of the Bible as a science text, as Jaime says, is basically illegitimate and misses the point of the Scriptures. In one sense, we need to stop trying to see simple, one-to-one relationships between natural phenomena and the acts of God. Doing so makes God into “the God of the gaps”, the gaps being what we have yet to explain about nature via science. Neil deGrasse Tyson recently said that if you have a God of the Gaps, you’re going to have an ever-diminishing God. I think we misunderstand God and the nature of his actions by trying to tie him directly to natural phenomena. God is behind all things, the creator and sustainer of all things, and his action and nature cannot be captured by science, which deals strictly with the mensurable and the quantifiable. God, by definition, is neither. Science, by necessity, will always miss the ultimate cause behind all phenomena, because that cause is beyond its ken. Personally, I am a creationist in the sense of understanding that God created the universe and sustains it. I reject, however, creationism that depends on a literalist interpretation of Genesis, or that rejects the findings of science within its valid scope of investigation. I also reject a “scientistic” (as opposed scientific) viewpoint that creates a false idol of science and reason and supposes that only science can provide valid answers for all questions of any sort for all time. doug–i think you and i are very much on the same page, if not the same paragraph on this issue. thank you for reading and for your contribution to the discussion. In the ten or so minutes I watched of the debate, Ken Ham said something that he deserves credit for and that his followers and like-minded folk should remember: a Christian is saved through faith in Christ, not faith in the age of the earth. He also said that he does not think Christians who believe the universe is old are not Christians. He then went on to say something about why he thought they were wrong, but anyway that he acknowledged that they were Christians and all but said that believing a certain age of the earth was not essential to salvation was quite remarkable. I guess I tuned in for just the right moment. I wonder how many of those jibber-jabbering about the debate online now found it to be as salient as I did. virgl–i am glad to hear you report that, because i think that is an important point to be made within the Christian community. as to the jibber-jabbering, i can tell you that is what got my attention. my twitter feeds just exploded last night with quotes back and forth on this as if it were of the utmost importance. that is where i think the ‘debate’ format doesn’t serve us very well. thanks for commenting and reading. as always you provide a great insight. 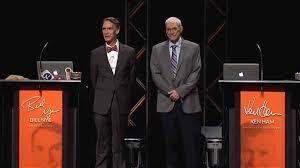 Sorry, a thought belatedly occurred to me– an ersatz “debate” between two individuals with such hardened and diametrically opposed ideological commitments as Bill Nye and Ken Ham are pointless– it produces nothing in the way of enlightenment. It’s a show, not a discussion. Instead, put someone like Ken Ham in a debate with another Christian who has an understanding and appreciation of both the Bible and the findings of science. With a common starting point, there’s a chance of a real discussion and some mutual understanding. yeah, that would be nice, i think, but the problem is, most Christ-followers who have a more nuanced view of Scripture and faith would, as i would, decline such a venture as unproductive. instead, we’d rather go have a cup of coffee or take a walk in the part and just talk–listen–and maybe even pray together as individuals. Well stated, Greenbean! You and I are exactly of like mind on this creation issue. Wandering the internet I stumbled upon your blog. I like it a lot and will familiarise myself with your blog before I can raise any points. I am a philosophical Christian, who underwrites that believe in God, as the Ultimate Cause, is rational and that inspired Scripture and teachings about God are very important for discovering the Truth but are intrinsically fallible because they are written by a fallible human mind and hand. In my mind science is easier to get engaged in than faith, because science does not have to be true. It is a mere tool to describe the physical world as we, humans, can currently observe or think it. For example, it would be foolish to “revere” the General Relativity Theory or Quantum Mechanics, because it is almost certain that in a 1000 years’ time both theories will only be quoted in history books as significant former but wrong theories. Science progresses by finding mistakes in established theories. Therefore a true scientist should not defend that he or she holds the Truth. Faith in an Ultimate Cause, sustainer of all possible realities, is an entirely different concept, because it has to be the Truth. Either there is an ultimate cause or there is not! I am happy with my current understanding of scientific truth and see no conflict with any challenge from the event most fundamental religious person. On the other hand, I still trying to fully understand the concept of the Truth (as the Ultimate Cause) and also do not fully understand how a challenge by science can aid an open-minded faithful quest. It appears that religious challenge of science is positive, whereas religious agreement with science does not lead anywhere. On the other hand, for honest faith it seems to be the other way around, when science confirms then it contributes positively whereas scientific challenge leads to nowhere. To me that is the reason why discussions with drawn swords (apart from over a coffee or a beer) between a scientist and a religious person are, per definitions, fruitless. Many thanks for your blog! I have a feeling that your work will aid my further in my quest to understand the nature of the Truth.